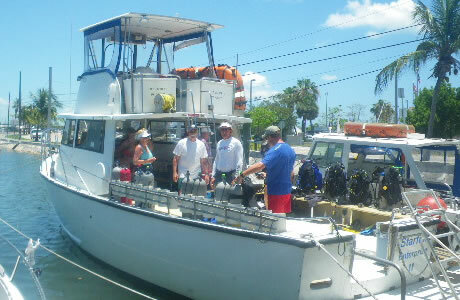 Seaduction is a dive center in Key West that provides equipment and repair services as well as daily scuba diving charters to a variety of dive sites around Key West. The company also provides core courses for open water and advanced open water scuba diving, and specialty courses in deep diving, wreck diving, enriched air/nitrox and other technical diving subjects. Seaduction probably offers one of the most comprehensive course listings available in Key West. There are literally dozens of courses available including underwater photography and videography courses. So if you're in search of something specific and you can't find it elsewhere, there's a good chance you'll be able to get the training you're looking for at Seaduction. Seaduction's two charter boats will take you to numerous different dive sites upon your request including Alexander's Wreck, All Alone, Eastern Dry Rocks, Marquesas Reef Line, Nine Foot Stake, Rock Key, the Sambo Reefs, Sand Key, Smith Shoal, Ten Fathom Ledge, the USS Curb, the USS Wilkes Barre, and the brand new U.S.N.S. Vandenberg. The Vandenberg is the newest shipwreck in these waters and requires an advanced certification or higher in order to dive. Along with wreck and reef dives during the day, the dive shop also offers nighttime trips for visitors who want to see the nocturnal marine life around the Keys. The dive shop has received a number of very positive reviews from visitors, most of whom remark upon the friendliness of the staff and how they were willing to work above and beyond to accommodate schedules. New and advanced divers said that they were impressed with the professionalism of the trainers and the boat crews and enjoyed visiting the Vandenberg and the many other exciting dive sites.